The Uttar Pradesh government in 1996 (now Uttaranchal) started an ambitious tea plantation programme, which was to be spread across 12,000 hectares (ha). It included a series of tea estates to aid the state's economy and provide farmers with an additional source of income. Now, after 10 years, out of the four projected tea estates, the Kausani Tea Estate has become fully operational. But that's hardly any good news. The estate has spelt doom for 180 marginal farmers in 152 villages of Kausani. Earning additional income doesn't figure anywhere and farmers' basic livelihood stands threatened. They are losing their agricultural land to tea estates for paltry sums while drawing wage for working in their own fields. The state government is also planning to handover the leased land to private players for tea, tourism and real estate. Brewing bitterness Nine families from Saurdhar village in Kausani became the first participants of the project in 1996 by offering 7.5 ha of their most productive agricultural land, for a 30-year lease to the government, at the rate of Rs 1,000 per year (with the lease rate to increase by Rs 500 every four years, till it reaches Rs 2,500 per year). The Uttaranchal government also promised a labourer's job to one member from every family that signed a contract of 0.5 ha as lease with the state government. "This is a wrong choice we made. Earlier, we used to grow paddy and madua in this land. Today, we are buying food from the market, working in our own fields and getting even lesser than what daily wage labourers get," says Chatur Singh, a 54-year-old farmer who left a job in Ahmedabad to join the tea industry. Later, he felt duped because he got Rs 33 per day and had to work in not-so-amiable conditions. Even, supporting his eight-member family was tough. The income issue is complicated, since the average land holding of farmers in the region is in the range of 0.5 ha-1 ha. Which means, with an average family size of eight, only one or two persons can get employment, while most of them give up their agricultural land completely. "We were assured that we would earn a regular income and that our land will be put to best use. But today, we struggle to earn half the average of daily labourers' wage, that too, for just half the year," says 25-year-old Pawan Kumar of Saurdhar. The process of leasing was against farmers' interests anyway, says a senior official in the Uttaranchal government, who has also worked with the Uttaranchal Tea Development Board (utdb). The gestation period in tea plantation industry is quite long. An average tea plant takes at least three years to start leaf production for commercial purposes and ten years to become viable commercially. During this period, farmers get to work for only three or four months, since leaf picking is the major operation. Besides, wages given to farmers are very low. When the Kausani plantation began in 1996-1997, the wage given was Rs 33, which was increased to Rs 47 in 1999-2000. After farmers formed a union and protested, the wage was increased to Rs 72 per day in 2005. "This is still lower than the average state daily wage of Rs 100," says Nav Kishore, a plantation labourer. The state government, on the other hand, sells the leaves for Rs 20 per kg to factories. The daily wage is given on the basis of eight hours of work and only when a labourer collects 12 kg of leaves. "But this 12-kg-a-day picking is sustainable only when tea plants are 10 years old, and the major leaf-picking season lasts for four months only, out of a total of nine months between March and November," says Ajay Kumar, a Darjeeling-based private tea planter.For every kg less, Rs 6 is deducted from the worker's wage. The Kausani estate has grown only to 60 per cent of the capacity, which means lesser leaves and less work for farmers, says Jagdish Prasad, assistant development officer with the Tea Board of India. Tamang, who manages the Kausani tea estate, disagrees. "The plantation is close to its full capacity of planting and we have managed to give them year-round employment with a wage of Rs 72 per day. We also give them Sundays as paid holidays." Farmers term this a blatant lie. "We hardly manage to get Rs 50 on an average per day and when we pick more than 12 kg there is no extra pay," says Pawan Kumar, a plantation worker. Kumara Devi, another worker, says, "If we don't work for a day there is no payment. We work under extreme conditions, be it heavy rains, which continue for seven months in the hills, or snowfall". After protests, women have been provided with raincoats but men continue to work without any. The land-use pattern of the area under tea cultivation is also held suspect. R S Adhikary, director, utdb says, "We have got only pastoral land which has no use for farmers and thus, this is a mode of additional income." But the truth, Down To Earth found, is that most of the land under tea cultivation is close to water sources and farmers confirmed that their land was previously used for food crop cultivation. Real estate boom in the state has raised prices in the valley, especially in the Kumaon region, including places like Rudrapur, Nainital, Bhimtal and Naukuchiatal. "Most of the government land is already sold or is up for sale. 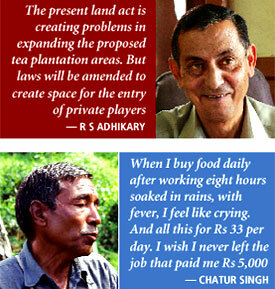 Private players are targeting farmers' land now," says Arjun Nautiyal, a researcher with Kumaon University in Almora. Tea industry aside, organic, herbal and fruit estates are also being promoted, adds Nautiyal. But the Uttaranchal Land Reform Act, 2003, doesn't permit sale and large scale leasing of farmland to private entities from outside the state (leasing limited to 400 square metres or 0.004 ha). "The act and small landholding of farmers is creating problems in expanding the proposed tea plantation areas," says Adhikary. But he strongly feels that laws will be amended to create space for private players' entry. "With strong political backing for tea promotion the land law will be amended soon to ensure a smooth entry for private players," he says. "It will be ensured that the estate developers will get consolidated land according to their feasibility," he adds. utdb also has plans to handover its four tea estates at Kausani, Champawat, Bhimtal and Nauti to private players, say sources. The proposal, however, was shelved as the Kausani tea workers union opposed it six months ago. But transfer of lease is easy since farmers have no control on it for the next 20 years. M B Tamang, scientist and tea expert with utdb, confirms the transfer saying it will be a tri-partite agreement and utdb will be the guarantors for both farmers and private parties. The reason for this handover, according to Prasad, is that state authorities do not manage tea estates properly. While a series of villages have given up their land to cultivate tea, villages like Pingalkot, 5 km from Kausani, are firm about not giving up their land. 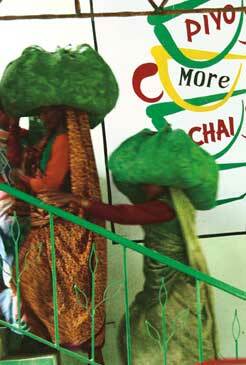 "We understand the tea business is profitable, but it will not be enough for our livelihood. Moreover, we are answerable to our children, so we have kept our paddy fields," says Surili Devi of Pingalkot. But such examples are sparse. The majority of those who have given up their land in the hope of a brighter future continue to suffer.